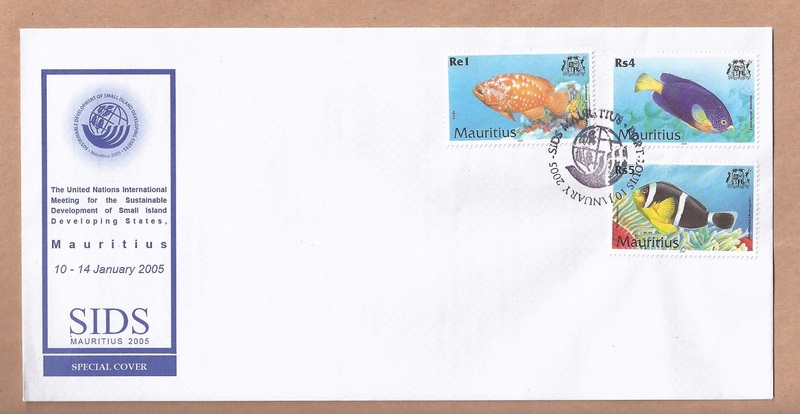 The Mauritius Post released on 10 January 2005 a Special Commemorative Cover to mark the United Nations International Meeting to Review the Implementation of the Programme of Action for the Sustainable Development of Small Island Developing States held in Mauritius from 10-14 January 2005. Since the United Nations Conference on Environment and Development in 1992, Small Island Developing States (SIDS) and islands supporting small communities have been considered 'a special case both for environment and development.' The first Global Conference on Sustainable Development of SIDS in Barbados in 1994 adopted the Barbados Programme of Action (BPoA). This has been an important blueprint for the sustainable development of SIDS recognising the uniqueness of small islands, their vulnerability and specificity. The World Summit on Sustainable Development in 2002 further reasserted the special challenges of SIDS and the relevance of the 'special needs' was again stressed in the Millenium Development Goals. One of the recommendations of the Johannesburg Plan of Implementation was that a 'full and comprehensive review of the implementation of the BPoA for the sustainable development of SIDS takes place in 2004. All SIDS are characterised by inescapable limitations: small domestic markets, isolation, narrow resource base and dependence on external trade. Mauritius has overcome many of these obstacles, but the advantages on which it has built its economic and social progress now constitute threats to its future prosperity. Its development has affected the natural environmental resources on which its future depends. N.B. : The above text is from the SCC insert. 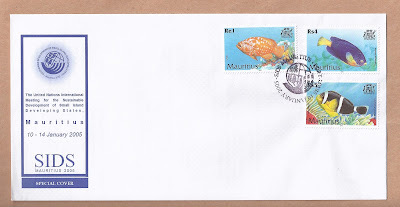 From the 'Fishes of Mauritius' definitive issue of 9 October 2000.